It is the best indicator for trading the forex news releases. It is a handy tool that gives you information about major economic events from all over the world in your charts. The indicator works well on every currency pair available on the Forex market. It offers real-time newsfeeds along with its impact on corresponding currency pairs. Newsfeed indicator updates itself according to the current date and time offering you with the information about all the upcoming news events. It displays an active timer on chart before any major news event happens which really helps you to know the actual impact of a news and trade safely. The indicator shows precise data about a news event including the actual, forecast and previous values of the particular event along with its importance. Forex trading is not just about technical indicators, candlestick patterns and support and resistance lines! There are many economic, social and political forces that influence the market every day. Success in Forex trading involves combining the precise predictions of technical analysis with the predictions based on the supply and demand in the worldwide economy. But we understood that many traders feel the inconvenience of not having an indicator that helps you trade the forex news events. So, we have developed this cool indicator that assists you by notifying you about the major forex news releases that happen every day around the clock. It is so simple to use, but extremely useful! You will see a clear yellow horizontal line in your currency chart that indicates an upcoming forex news event. Get it for free! Comes with an Interactive and customizable economic calendar. The Economic calendar is the lifeblood of every fundamental analyst. It needs to be checked every now and then and trading decisions have to be carefully made after considering the important news releases. But isn’t it very inconvenient to move your focus away from the charts, open up the browser and search for the news releases? We are going to make it very convenient for you by displaying a detailed, real-time, a customizable economic calendar that displays news releases which are relevant to the currency pairs of every individual chart. So, as soon as you open a chart, you will see all the upcoming major events. It also indicates every event by displaying a line on the chart that corresponds to the time of the news release. Download for Free! By using our Newsfeed indicator, handpick the currencies and economic releases according to your preference and take your Forex trading career to the next level! These are the testimonials from our very recent customers, Check this out. I used to look up for various news events from multiple websites like Daily FX, Forex Factory, My FXbook, etc. Yet I missed them most of the times. However, after getting this tool, I never missed out a single news release and always have stayed ahead of it. It's really a much helpful for a full-time trader like me. Thanks team for making one though. I used to check with TraderPulse website every once in a while to see if they have got any tool that can be totally different from what almost everyone in Forex offers. Finally, I came across this tool which offers live news feed on your chart itself. I am pretty happy with the product. Thanks a lot for considering my suggestions. I often forget to check the news while trading and that used to affect the performance of my trades a lot. But after I used this tool for a month, I can see some real improvement in my trading. I focus more on US economic news releases and it gives this tool just offers me with all the info I need. I started trading one year ago. First, I used your signals, then bought this Newsfeed indicator. I ran into a problem while installing this indicator, but your support staff, fixed it the next day. I like the ability to see the news details in my chart and so far, there are no complaints. I prefer a pop-up alert to alert me when there is going to be a news release in the next few hours.It is not available in this indicator though. But other than that, I must say that this indicator is very useful for traders. Every trader needs this. I lost about $500 one day when I placed a few trades relying only on technical analysis. But I wasn't aware of JPY Convenience Store Sales that was to be released on that day.Now with this handy tool, there is no such fear. Take Your Forex Trading To The Next Level! By harnessing the power of both fundamental and technical analysis, you can maximize your gains and take away more profit than you used to. If you have never worried about trading the forex news, then it is better to start now! Need more help? You can reach us by Live Chat or write to us at support@wetalktrade.com for assistance. How do I install Newsfeed indicator? 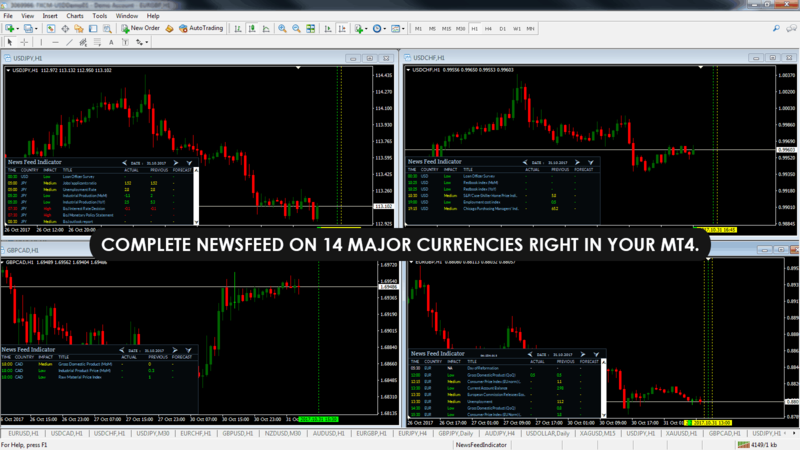 Newsfeed indicator is installed just like any other indicator for MT4. It is very easy to install. Our chat support is available 24/7 to help you if you run into any issues. How much is the price of Newsfeed indicator? Do I get a user manual along with the Indicator? Yes! We will send you a user manual after you download the indicator. The user guide gives you complete instructions on how to install, use and customize the indicator. Does there exist any hidden charges for the Indicator? Obviously No! The indicator is completely free for a lifetime. You will also get all the future updates absolutely free as we will be adding new features whenever there is a possibility to improve the product. Hey Buddy!, I found this information for you: "Newsfeed Indicator – Live Forex News Events In Your MT4/MT5". Here is the website link: https://wetalktrade.com/newsfeed-indicator-forex-news-events/. Thank you.